To maximize water conservation and minimize water costs, have Green Guys inspect your sprinkler irrigation system for efficiency. We adjust to changes in landscape maturation, and implement modifications that complement the change in your maintenance needs, that compliment changes in the weather. Needing a makeover on your current landscape or it is currently an empty slate in your new home, Green Guys can help! We love turning landscape dreams into reality! In order to maintain the landscape looking beautiful and the envy of the neighborhood, invest in an automated sprinkler system. We have installed over 3,500 and know how to build them properly. 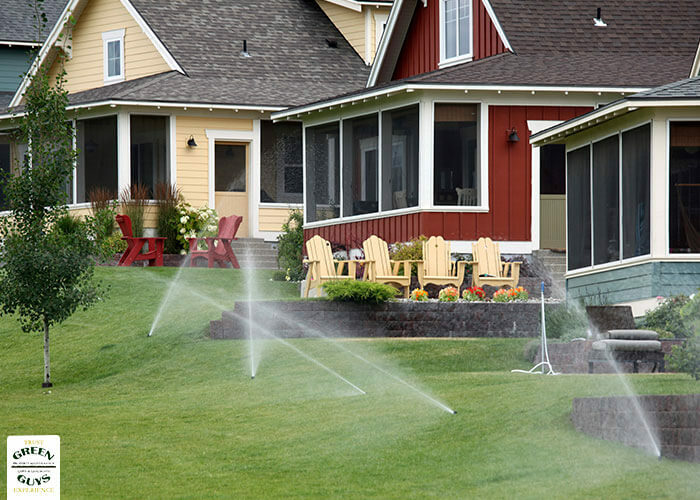 A well-installed and maintained sprinkler system should not have sprinkler repairs for the first 15-years. We stand behind our commitment to customer service, and pride ourselves on our ability to effectively serve our clients. It is our personalized service that distinguishes us from our competitors as experts in lawn care and maintenance, a sentiment that is reflected by our A+ rating by the Better Business Bureau.